Sometimes relationships develop over a long period of time. 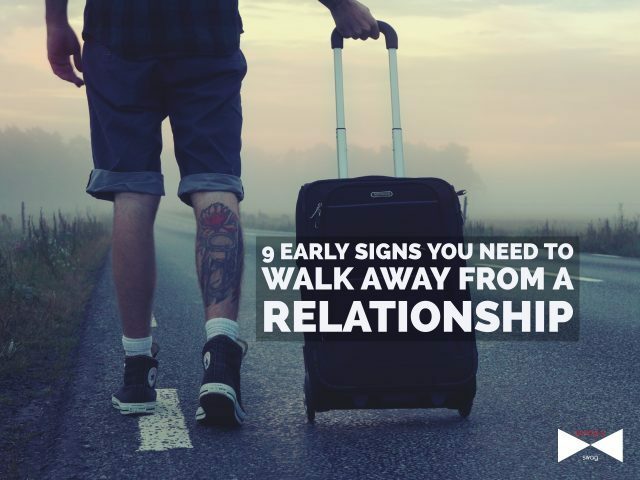 But, today we’re going to discuss signs you need to walk away from a relationship that’s in the rapid, budding phase. I recently had to make the difficult decision that the girl I had just started seeing wasn’t the right fit. She was fun, charming, attractive, and definitely would have provided a lot of pleasure short term. But a long term relationship definitely wouldn’t have worked. Questions may come up after the first few dates: Is this relationship right for me? Can this work long term? It can be hard to be honest with ourselves when we question our relationships, especially if we’re attracted to the person or if they’re filling the romantic void that’s been empty for a long time. 1. You have different core values and life goals. If you value family and faith over everything else and are dating someone whose interests and goals are elsewhere, it may not work. If your desire is to travel the world and she wants to start a family right away, then you’ll struggle. The core values and goals you have are important. If her values and goals don’t align with yours then you’ll be facing big obstacles in the long run. 2. Your political views are totally different. You and your girlfriend will always have differences, some bigger than others. I’ve dated girls who have disagreed with me on some topics. But now, with the spectrum of political viewpoints and the stark polarization between many of them, having a different standpoint in politics has sadly become incompatible. Maybe it’s because political views point to a much deeper difference in values. These core values, as we just discussed, are how we interpret the world. 3. You have differing spiritual beliefs. Or views on the importance of your beliefs. As a Christian, I’ve heard the whole “don’t missionary date” often. “Unequally yoked” also comes up frequently. But what mentors often fail to mention is that you can be unequally yoked with others in your same faith. If your faith is the center of your life and the girl you date sees it as a background piece of her life, the relationship might be no different than dating a girl of a completely different faith. 4. You speak totally different love languages. My primary love language is, without a doubt, physical touch. A past relationship I was in was with a girl who wasn’t comfortable with it at all. Hand holding, cuddling…it simply wasn’t her thing, and I felt starved for affection. It’s one thing if your love languages are different, but you make the effort to speak the other’s. But if you simply can’t or won’t then it can create a problem in the future. 5. You have no common interests whatsoever. This might seem like a pretty obvious one. It’s completely fine and normal if you have some differing interests. In fact, it might be for the best. But it’s important to have some common ground over which to bond. Shared values make a stable relationship and shared interests make a fun one. 6. They treat other people poorly. On a date, you’re likely to interact with baristas, waiters, or cashiers. How they treat these people is telling of who they are and how they’ll treat you and your friends. How we act towards those who can’t do anything for us or who are obligated to serve us says a huge deal about who we are. So watch out for that on your dates. 7. You feel uncomfortable discussing certain topics because you fear their reaction. One of the fundamental aspects of love is vulnerability, and if we’re unable to be vulnerable with the person we’re seeing it points to an underlying problem. This doesn’t mean that we should tell them everything on the first date, but over time, a level of trust and security should be built. 8. You discover they do not vibe with your family at all. When we marry someone people often forget that we marry into their families too. Tensions that start at the beginning are likely to continue for however long you two are together. And that begs the question: Is it worth it? Maybe it is and you’re family is just a little crazy. Or maybe your family will immediately spot the problems with the relationship that you’ve been ignoring and telling yourself aren’t big. 9. You’re not attracted to them. This doesn’t apply solely to physical attraction, but also to the general feeling of being drawn to someone and wanting to know them better. Some kind of chemistry and desire to continue seeing the other person should be intact. If it doesn’t click now, it might not click in the future. A few years ago I’d have to pay someone for this inanrmftioo. Thanks for your thtgshou. It’s helped me a lot.